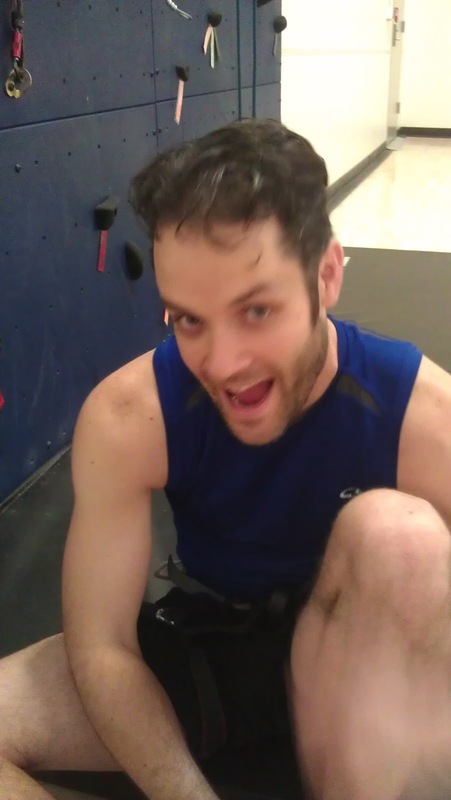 The Fitness Adventures of Warlord Blade: Grappling in a Gi! Thursday and Friday gave me TWO DAYS of Brazilian Jujitsu training in a row! So a while back I mentioned how excited I was to be given a hand-me-down gi. Thursday's class we wore the Gi's the whole time, and let me tell you, that's quite different! It seems like some movements are harder to accomplish, and some are easier, but overall most of the finishers seem to take just a little bit longer. It's also very hot in a gi! Also - I got a nice 'burn' from the gi on my eye... Luckily it faded right into my normal Zombie dark circles around my eyes fairly quickly! That class went fast! Lots of agility required.Here's the movements - I might add videos later! Friday morning was a great small Yoga class (me and the KungFu guy that has been coming to BJJ and the instructor) followed by a much needed Rock Climbing session on the wall. I started climbing by going arms-only for about 15 ft up... WOW. That made the rest of my planned 30 minutes MUCH more difficult. By the end my arms and shoulders were tired and sore, which is exactly what I want out of these rock climbing sessions! The Climbing Wall as I finish! I look dumb. That afternoon I was planning on going to Crossfit but was invited to another BJJ practice. Mark had learned some things the night before he wanted to go over, including a repeat of some of the butterfly to X-guard moves we went over on Thursday.We also covered some arm drag movements from butterfly... I think! Repetition is a GOOD thing for me! I'm finally becoming more comfortable with butterfly guard, and I'm actually more comfortable when Mounted (which is normally not a position you want to be in) than I am in many other positions. Weird. It's nice to have some tools and things you can actually DO and pull off. During the grappling afterwards I was actually able to execute a butterfly sweep against Micah, which is pretty amazing considering I'm still very beginner in comparison. Not that I achieved anything by it, he very quickly got me in an armbar or a choke! Adding BJJ's armbars, kimuras, and americanas to the already sore arms from yoga and climbing... My arms were beat! Next up, family sickness and one of my first time 'bagging' a real peak (if you don't count last weekends' View Benchmark as a Peak... it IS a summit!) - Grandeur Peak, almost 8300'!